German developer Crytek has done some research into the technology behind streaming videogame services like OnLive and says that such systems could in fact work - in about, oh, 2013 or so. OnLive, a "cloud computing-based" system that will make use of centralized servers and streaming video to offer on-demand gaming without the need for high-end hardware, was revealed in late March. The system will work with conventional mid-range PCs, including laptops and netbooks, or through a "MicroConsole" provided by OnLive, prompting co-creator Steve Perlman to predict that the current console generation would be the last one. The announcement of OnLive and similar services has prompted a great deal of discussion about streaming games, with most observers expressing strong skepticism that such systems are viable. 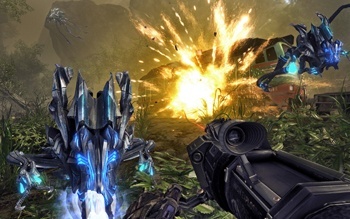 Crytek CEO Cevat Yerli, whose game Crysis was used to demonstrate the technology at the 2009 Game Developers Conference, said a service like OnLive will be technologically possible, but not anytime soon. "We had our research in 2005 on this subject but we stopped around 2007 because we had doubts about economics of scale," he told GamesIndustry. "We saw that by 2013 - 2015 with the development of bandwidths and household connections worldwide that it might become more viable then." The weak link, according to Yerli, is the broadband technology necessary to provide smooth, uninterrupted gameplay, which he claimed isn't yet in place. "It doesn't take a lot to make a video-based renderer, but what you need is the right infrastructure that is beyond the technology we have, it's more like cable net providers and communication networks," he said. "They have to provide fast bandwidths and connectivity in order to allow such technology to excel." Yerli admitted that despite Crysis Warhead being one of OnLive's headline titles, he hadn't actually seen the system up close, and said that despite his reservations he hoped it worked out. "I want to see it myself. I don't want to say it's either 'top or flop'. I hope it works for them because it could improve gamers lives," he said. "The technology of video-based rendering is not actually a very new concept but they do some things that others didn't do before so it will be interesting to see."